Deb's Cup of Tea: Baking Again! I've spent a summer struggling to come to terms with limited mobility. It means that my cleaning of the kitchen is generally a 2-3 day affair as I can't stand for long periods of time nor do I want to be standing up and sitting down repeatedly. It does get a bit easier towards the end of the day but the pain in my knees and right hand is still uncomfortable. I'm having slow drain issues with the kitchen sink and I certainly don't have the money to have a plumber come out and spend a half day replacing those pipes. Add in the onslaught of ants and I really didn't want to be anywhere near the kitchen. It may be the heart of some people's homes but, in August, the less I had to be in there, the happier I was. But you all know I love to cook and I feel I'm short changing myself when I don't cook. So this weekend, with the ants under control, I spent Saturday doing all the dishes to clear the counter and stove so I could cook on Sunday. I have a stack of recipes I want to try, everything from breakfast to main dish to dessert. 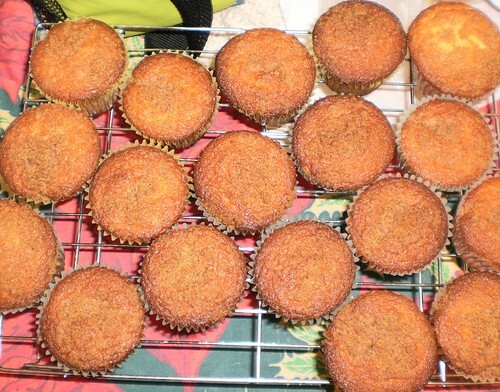 I picked something easy off the pile, Snickerdoodle Cupcakes. They are ridiculously easy to make and the recipe made 18 for me although it clearly states it should only make a dozen. The cupcakes are topped with a butter, brown sugar and cinnamon mix to which you can add nuts but snickerdoodle cookies don't have nuts in them so I left that out. I have a problem with the oven. These are to bake for 25-30 minutes. I left them in only 25 minutes (My house smelled wonderful.) and I have about 4 or 5 where the bottoms are burnt. Daniel is going to faint dead away but I don't have an oven thermometer. I haven't had one in over a decade. Might be something to put on "ye olde Christmas list". But I think the heat in the oven is a not uniform. This is an odd temperature to bake at too, 375. Most baking is 350. I want to try this again only leaving them in for 20 minutes. They still taste wonderful, just like a cake version of the cookie. I tossed them in the freezer. They will be great for lunches and quick snacks. I'm still not adding nuts to the topping, though. Real snickerdoodle cookies do not have nuts.